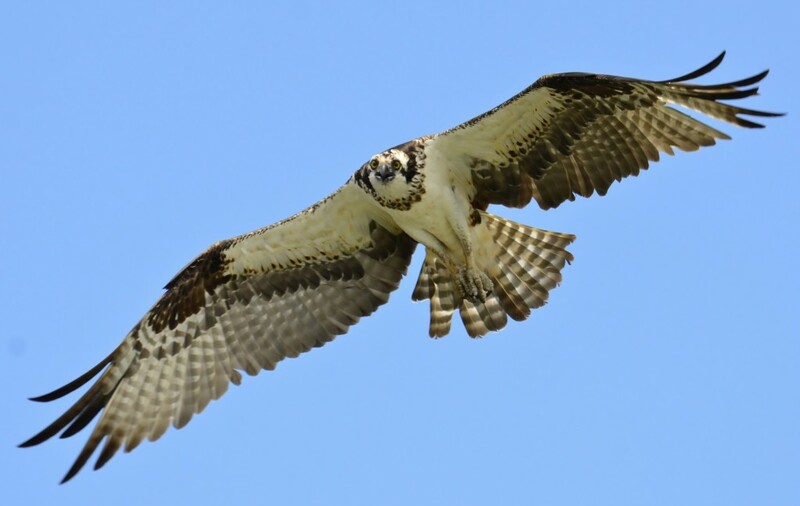 “Osprey in flight over Lake Wylie” by Gareth Rasberry. Licensed under CC BY-SA 3.0 via Commons. I went running today (December 12, 2015) in New York in 65° climate-changed weather. An osprey flew out of a tree as I labored past, crossing a hundred yards with a few lazy flaps of wings that spanned perhaps six feet. In her environmental classic Silent Spring (1962), Rachel Carson told the story of how a horse went to drink at a trough in Stony Brook NY, where I live, just after a plane had passed by spraying DDT. The horse dropped dead. Less visibly, DDT thins the shells of birds’ eggs. Ospreys became all but extinct on the East Coast and had to be reintroduced once DDT had been banned. So the sight of this full grown bird was a triumph of a kind, a visible index of how administered ecological reform can produce change. It made me wonder whether the climate treaty agreed this same day in Paris at COP 21 will one day be the subject of similar posts, fifty years in the future. Could we not say the same thing about modernity in general? Dawn, January 17, 1770. The Endeavour, a former coaler from Whitby, is transporting Captain James Cook around the world in search of the legendary Southern continent for colonial settlement. It’s obvious that this island isn’t it. The Captain was in a fury about the indigenous people, who he thought to be cannibals. They don’t have a name yet. They call themselves by the name of their different iwi (people), they are not yet Maori, which means ordinary in te reo, in opposition to Pakeha, the stranger. Pause for a second to consider this exemplary moment of the Anthropocene. A fossil fuel delivery vehicle has been converted into the agent of British imperialism. As the emissary of the modern Rome, Cook expects the indigenous to roll over for him, as fish were said to do for the osprey. For him, sovereignty was the natural prerogative of the imperial voyager but those who would later call themselves Maori had not got the memo. They resisted. This morn I was awak’d by the singing of the birds ashore from whence we are distant not a quarter of a mile, the numbers of them were certainly very great who seem’d to strain their throats with emulation perhaps; their voices were certainly the mos[t] melodious wild musick I have ever heard, almost imitating small bells but with the most tuneable silver sound imaginable. The tinkling sound (listen here) was made by the Korimako, later known to Europeans as the Bellbird. At least 25 species of native birds that Banks heard are now extinct. And it is also true that the Maori had eaten all the large flightless birds that dominated the islands when they arrived. But the Moa, as they called them, didn’t sing. What were the birds saying, given that ornithologists now seem to agree with storytellers throughout history that birdsong has meaning? Among their polyphony, surely they were anticipating what the Eora people would say to Cook in what we now call Australia: “Go away.” The collective sound was the sound of natural sovereignty, or what we might call autonomy. shortly after daylight a number of birds of various kinds join their voices in a wild jubilee of song, which, generally speaking, is of very short duration. Buller identified the chorus as consisting of Bellbirds, Tui, Whiteheads and Piopio ( a thrush) (for a modern version, go here). A prosaic writer who believed most Aotearoa birds, like the Maori, to be “doomed to extinction,” it is striking to see Buller take flight into such a poetic evocation. The Biblical Jubilee is the moment of release, when slavery is ended, debts canceled and the land lies fallow. It comes every 25 or 50 years, depending on which version you credit. The wild jubilee is the moment of uprising against (human) enslavement, a moment of pure freedom and pleasure in being. The birds were putting out a call to action, the general strike against the Anthropocene, the assertion of autonomy. When will it be heard? Before any humans arrived, birds ran the islands that are now Aotearoa New Zealand. On some of the offshore islands they still do. 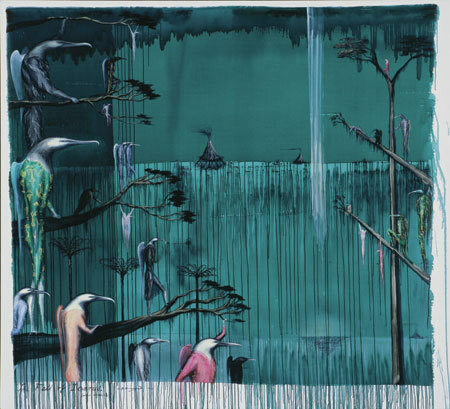 When the artist Bill Hammond visualized the birdland of the past in 1996 as The Fall of Icarus, he must have thought it was a depiction of this past encounter. Perhaps we might see it now as a message from the future, in which mutant wild species, affected by the radiation from all the flooded nuclear power stations like Fukushima, watch the decline and fall of human modernity. Another way to look at the painting is to see the irrelevance of Icarus, aka “Western man.” Because, as so many writers have pointed out, not all people count as humans. Many are as disposable as the fish or the birds, subject to natural sovereignty, rather than its agents. 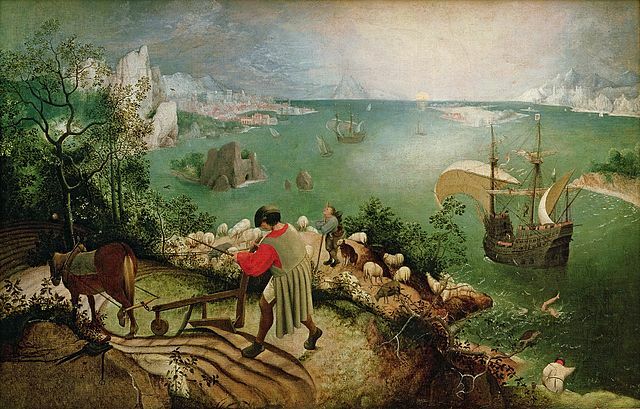 Such is often said to be the theme of Pieter Bruegel’s Icarus (c. 1590-95), in which the would-be flyer plunges unnoticed into the sea, while farming carries on regardless. But those ships in the harbor are not so innocent. A Dutch captain, Jan Huyghen van Linschoten, has just rounded the Cape of Good Hope, finding a route to East Asia. In 1602, the Dutch East India Company was established. The Company destroyed all clove trees in the Moluccas, except on two islands they controlled, to keep prices high and eliminate competition. And then they established a colony that would become South Africa. Tracking back, the real subject of Hammond’s fascination is the birds. Let us not fall into the fallacy that they are watching Icarus fall. They could care less. They are in assembly. 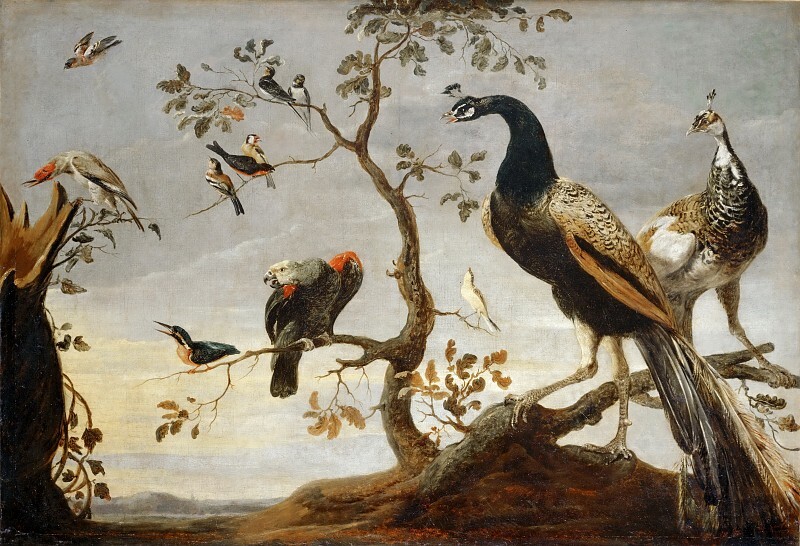 Another Dutch artist Frans Snyders has visualized this state of affairs in his Assembly of Birds (1630). Unlike most paintings of this genre, there’s no bird in charge. Often an owl directs a concert of birds. Synders or someone else, didn’t want a painting with one bird in power. It is an assembly, a transnational one at that because there’s a parrot among the European birds. The birds are speaking without debt, they owe nothing. in winter they assemble in large numbers, as if for business; for after confabulating together for some time with great uproar, they march off in bands in different directions. The speech of these birds is remarkable, often described as a “boom” (listen here). They have come very close to extinction, due to invasive species hunting them as well as human actions. 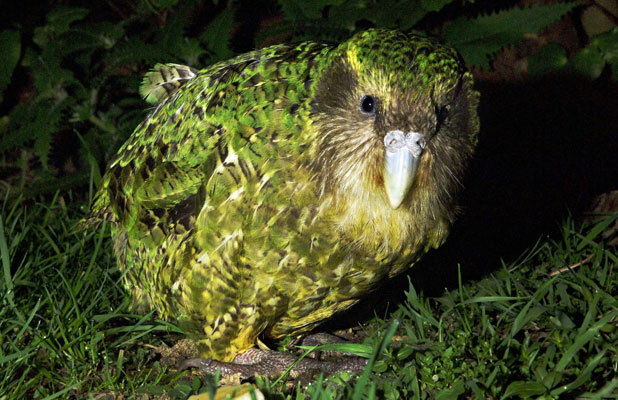 All known surviving birds, about 125, have been transferred to predator-free islands off the main islands of Aotearoa New Zealand. I shudder to think what they’re saying. These assemblies are far less likely in North America. Rachel Carson’s book title meant that the loss of bird life caused by DDT would bring about the absence of bird song and a “silent spring.” DDT is gone. But so too are many of the birds. Over half of North American bird species–314 varieties–are threatened with extinction by climate change. Common song birds have already declined by as much as 80% since 1967 due to a combination of environmental degradation and climate change. Not that anyone is listening, we’re all plugged into our phones. The MP3 is not the solution any more than the JPEG. 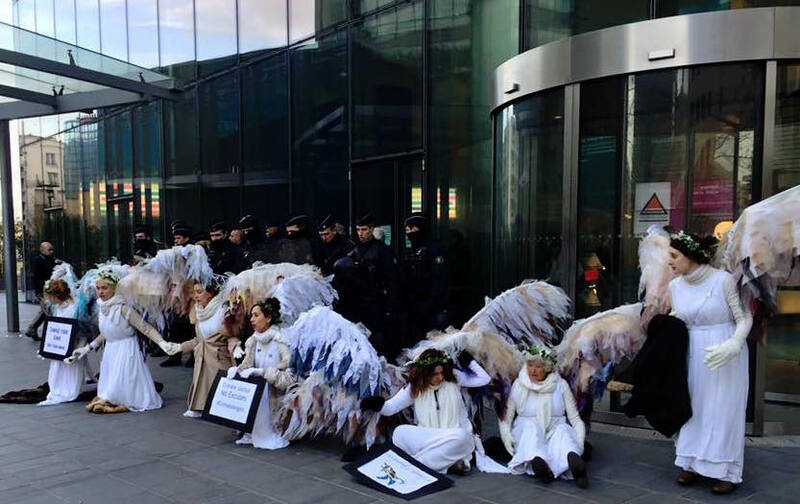 Climate Angels shut down ENGIE. Photo via Lisa Fithian. COP 21 by itself is nothing. Only direct action that forces companies and governments to act will close the wide gap between what it calls for and what is needed. 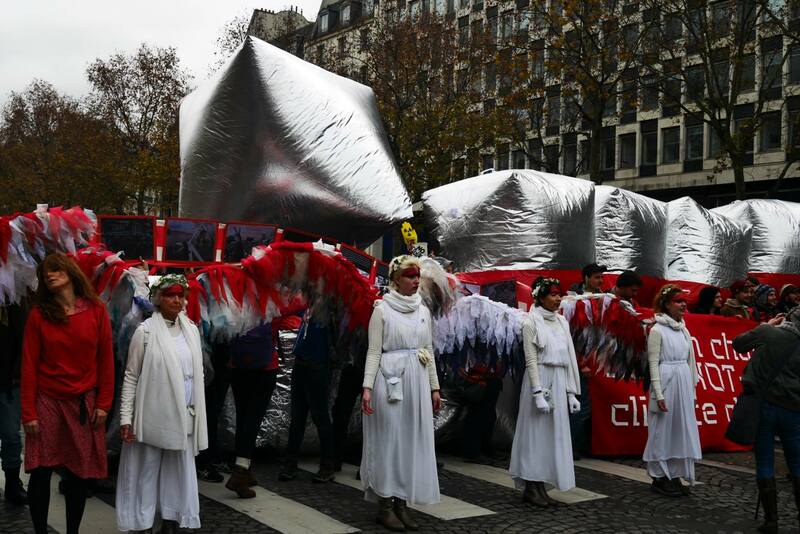 Above, the Climate Angels are shutting down ENGIE, a company derived from the venture to create the Suez Canal. Their Australian Hazelwood mine burned for over a month in 2014, causing deaths and environmental devastation. So they changed their name from GDF Suez to ENGIE and started talking about solar power, while maintaining an array of nuclear power stations and lobbying against emissions regulation. The Angels left ENGIE–some under arrest–with the call: “We’ll be back.” That’s what all the climate assemblies say. Join them.